Board adds Blue Lake Citrus, OWV water to business portfolio | Seminole Tribe of Florida, Inc. The Seminole Pride brand recently added Blue Lake Citrus Products and OWV water to its lineup of products that includes beef, electronic cigarettes, wines, Seminole/Stiles Construction and Development and commercial cleaning. Seminole Tribe of Florida, Inc. purchased 60 percent of Blue Lake Citrus, the parent company of Noble Food Service, in which a majority stake was acquired by the Tribe in April 2013. The partnership positions the company for significant growth through the Tribe’s existing distributors. Brighton Board Rep. Larry Howard organized a tour of the facility in March to give Tribal members a firsthand look at how the juice is processed. 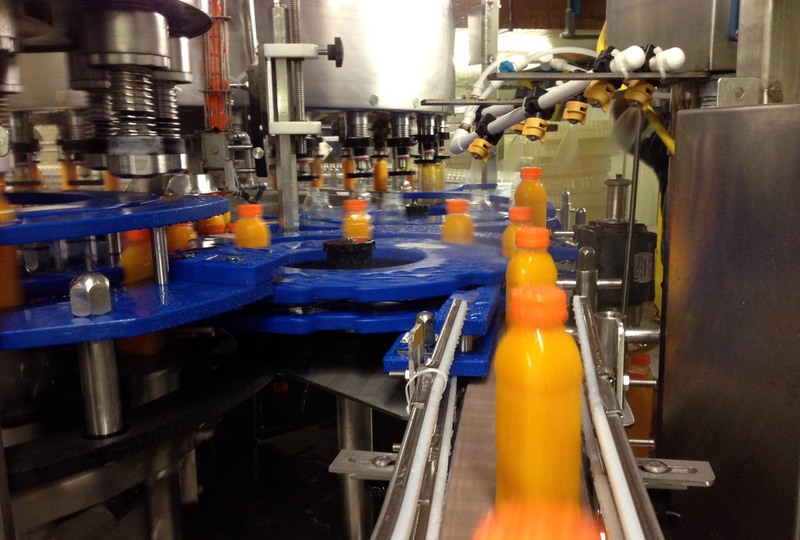 The plant, located in Winter Haven, Fla., produces about 7 million gallons of juice products per year from 1.2 million boxes of citrus fruit, averaging 90 pounds per box. Blue Lake products can be found in about 5,000 retail outlets, including Publix. The Tribe is converting the name to Noble Seminole Pride to celebrate the partnership. In addition to juice, Blue Lake sells citrus oil and citrus peel to businesses as diverse as flavor, cosmetic and aroma companies to manufacturers of cow feed. Dembeck said the byproducts are almost as valuable as the juice. The Noble Seminole Pride juice is made from Hamlin, Valencia and pineapple oranges with a hint of tangerine juice for added flavor and color. The company also develops fresh bar mixes to sell to chefs and beverage managers at restaurants for increased sales opportunities. The mixes are being used at Hard Rock Hotel & Casino Hollywood and Tampa. “The Tribe is growing and diversifying its business interests by partnering with local Florida, family companies to strengthen the people and agriculture of Florida,” said President Tony Sanchez Jr. in a statement. OWV premium spring water comes directly from historic Orange Springs near Ocala and has a higher alkaline content than typical bottled water. Pronounced ooo-wah, which means “water” in Creek, OWV is meant to compete with high-end bottled waters like Fiji and Evian. Having a variety of products allows Seminole Pride sales staff to ride along with distributors and schedule appointments with their customers’ purchasing decision makers. The Seminole Pride target market includes restaurants, schools, hotels, hospitals, catering businesses and grocery stores in Florida, Georgia and Alabama. Future growth could include the entire Eastern Seaboard.